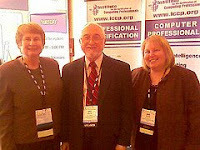 John Zachman announced his latest iteration of the Zachman Framework at the DAMA Symposium, the "Zachman Framework2." Along with the changes to the Framework, the ICCP is working on a new CDMP exam focused on the Zachman Enterprise Architecture. An exam outline has been developed and reviewed by John and by Stan Locke, with a proposed time frame for completion by the end of 2008.